Little Suzette and her nursemaid enjoy daily walks in the handsome park near their home, where they often see a tall, elegant lady strolling in the park with her tiny puppy. 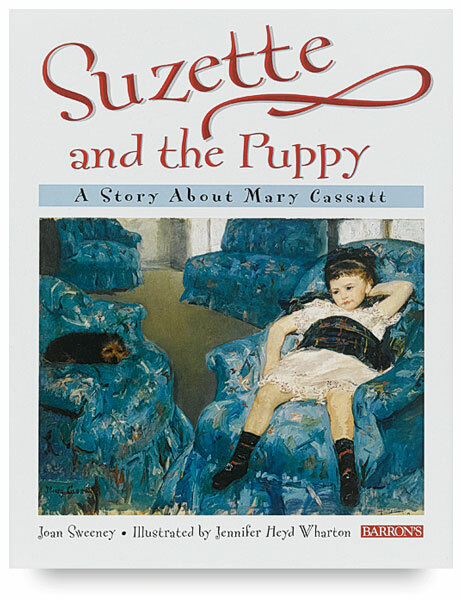 Then, a comical incident transforms Suzette and the puppy into friends. The time and place of this gentle story is Paris in the 1870s, when many fine artists were creating the exciting approach to painting called Impressionism. As it happens, little Suzette’s Uncle Edgar, the famous Edgar Degas, is one of those artists. One day, Uncle Edgar sends an artist to paint Suzette’s picture. Imagine Suzette’s surprise, when the artist turns out to be the tall lady from the park! And imagine Suzette’s delight when the little puppy comes with her! The result of this enchanting meeting lives on to this day in an art masterpiece, for the woman was the influential American artist, Mary Cassatt. Her painting of Suzette and the little dog, known as The Little Girl in the Blue Armchair , now hangs in the National Gallery of Art in Washington, D.C. Among this book’s many beautiful full-color illustrations is a reproduction of the story’s painting. Joan Sweeney was born and grew up in Toledo, Ohio. Her fondest memories as a child include walking through the Museum of Art galleries and attending Saturday art classes. She wrote her first book, Penguin Island , when she was six years old. Only one copy was made, which her father bought for a nickel. Sweeney has also worked as a newspaper reporter for a newspaper, a dream that grew from her interest in the comic strip reporter, Brenda Starr. Sweeney currently resides in Evanston, Illinois, and has three “grown-up” children and five grandchildren. Jennifer Heyd Wharton has earned recognition as one of the best-known artists in Maryland, and through her unique perspective on color and texture, is rapidly gaining attention throughout the United States. Proficient in many genres and mediums, she has primarily focused on the mediums of watercolor and oils to communicate her feelings and awareness of daily life. Heyd Wharton graduated with honors from Moore College of Art in Philadelphia, Pennsylvania, before beginning her career as a successful illustrator, package designer, and art director. She currently co-owns a gallery/studio in Easton, Maryland, called the Troika Gallery Fine Art Studio, and is well-known for her watercolors, murals, and illustrations, which are often seen in children’s books, newspapers, and magazines. Heyd Wharton’s paintings have won numerous awards from several art societies and federations in the eastern United States. She is a member of the Baltimore Watercolor Society and the Academy of Arts in Maryland. She is a featured artist in major galleries in Maryland, Washington D.C., Virginia, and surrounding states. Illustrator — Jennifer Heyd Wharton. Hardcover. 32 pages. 10¾" × 8¼" (27 cm × 21 cm).